"So that's it! You're a time meddler! No wonder you wanted to get rid of me!" That was a satisfying conclusion to the story. 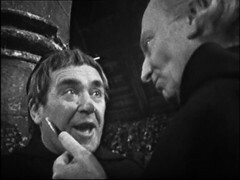 Lots of Hartnell & Butterworth together really make the episode, the exchanges between the two are fabulous. VICKI: Listen! Met Leonardo Da Vinci and discussed with him the principles of powered flight. STEVEN: What? Da Vinci lived in the middle ages. I know he tried to build a flying machine, a sort of aeroplane. 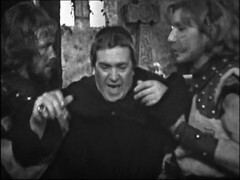 VICKI: I know and according to this it was the Monk who put him up to it. And listen to this: Put two hundred pounds in a London bank in 1968. Nipped forward two hundred years and collected a fortune in compound interest. DOCTOR: So that's it! You're a time meddler! No wonder you wanted to get rid of me. And what are you trying to get up to this time? MONK: I'm sure you'll approve, Doctor. DOCTOR: Are you quite mad? You know as well as I do the golden rule about space and time travelling. Never, never interfere with the course of history. DOCTOR: But you can't rewrite history! Not one line! MONK: And who says so? Doctor it's more fun my way. I can make things happen ahead of their time. MONK: Yes, indeed. For instance, do you really believe the ancient Britons could have built Stonehenge without the aid of my anti-gravitational lift? DOCTOR: And what mischief are you up to now? MONK: Mischief? No, no. A master plan. A master plan to end all master plans. DOCTOR: Oh, is that so? MONK: The whole course of history changed in one single swoop. DOCTOR: By wiping out the Viking fleet? MONK: Exactly, Doctor, exactly. Of course, obviously, I don't have to remind you that the main reason William the Conqueror won the Battle of Hastings, was because King Harold had to march to Stamford Bridge and defeat the Vikings first. DOCTOR: So you plan to save him the journey? MONK: That's right. Precisely. A fresh army, no desertions. Why King Harold will kick William back to Normandy before knows what happened. It's quite a plan, eh? DOCTOR: Oh, yes, it's quite a plan. It's quite a plan, yes. I count myself a very fortunate person indeed, to be here, in time to prevent this disgusting exhibition! 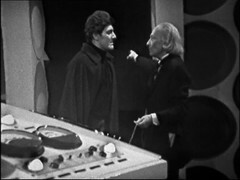 MONK: You haven't prevented it yet, Doctor. Why? What's the Monk going to gain by this? As Vicki asks what's his reason for doing what he is? MONK: I couldn't have picked a better place for my headquarters than this. A deserted monastery right on the coast, gullible peasants who believe everything I say to them. No, Doctor. No, I planned to materialise my ship right on this very spot disguised as a sarcophagus, and here it is. Yet more examples of the Monk's forward planning. DOCTOR: Yes, well, tell me, how does one exactly get into this sarcophagus? Hammer and chisel? MONK: This way, Doctor. Oh, er, mind your head. 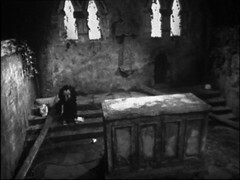 Note that the sarcophagus is roughly the same size as a Police Box tipped on it's side! 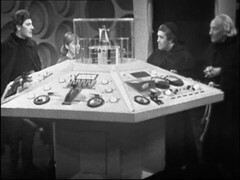 We get a lovely aerial view of the Monk's Tardis console at the start the episode. 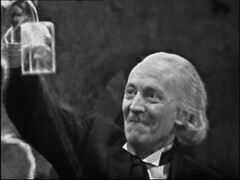 DOCTOR: The water cannot affect the Tardis. It won't wash away. It'll still be there when the tide goes down. Now stop fretting, my dear. Well, I must confess, er, I do congratulate you. It's a splendid machine. Although I do note there's been quite a few changes? 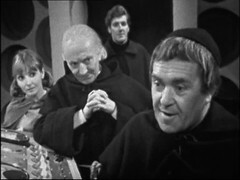 MONK: Oh, yes, indeed, Doctor. In fact this one is fitted with the automatic drift control. DOCTOR: Oh, I see, yes, of course. And, er, thereby you can suspend yourself in space with absolute safety. 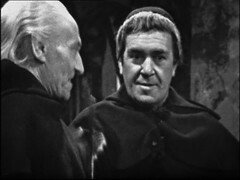 MONK: By the way, I tried to get into your police box but the door was locked. What type's yours, Doctor? DOCTOR: Mind your own business. STEVEN: Look, I take it you both come from the same place, Doctor? DOCTOR: Yes, I regret that we do, but I would say that I am fifty years earlier. 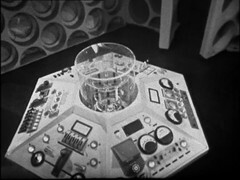 Many years later we'll learn that the Doctor's Tardis is a Type 40 TT capsule. DOCTOR: Now when are you going to answer my questions? DOCTOR: The reason for this deliberate destruction. MONK: I, I want to improve things. DOCTOR: Improve things? Improve things, yes, that's good. Very good. Improve what, for instance? MONK: Well, for instance, Harold, King Harold, I know he'd be a good king. There wouldn't be all those wars in Europe, those claims over France went on for years and years. With peace the people'd be able to better themselves. With a few hints and tips from me they'd be able to have jet airliners by 1320! Shakespeare'd be able to put Hamlet on television. 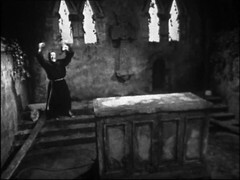 MONK: The play Hamlet on television. DOCTOR: Oh, yes, quite so, yes, of course, I do know the medium. STEVEN: Were you going to kill the Vikings? DOCTOR: What are we going to do with this fellow? What can we do with this man? He's utterly irresponsible. He wants to destroy the whole pattern of world history. A little expansion: most people are probably aware of The Battle Of Hastings, that it's the pivotal event in British history and, with apologies to W. C. Sellar and R. J. Yeatman, probably the only date that everyone can remember. But what isn't so well known is the events leading up to it. Following the death of Edward the Confessor while still childless the English line of succession was unclear. Harold Godwinson ascended to the throne in early 1066. Two challengers for the English throne Tostig Godwinson, King Harold's brother, and the Norwegian King Harald Hardrada together with a force of Norwegian soldiers defeated a hastily gathered army of Englishmen at the Battle of Fulford on 20 September 1066, and were in turn defeated by Harold at the Battle of Stamford Bridge five days later which left Harold's English army weary. William of Normandy landed his invasion forces in the south of England on 28 September 1066 forcing Harold to speed march his tired troops south, a major contributing factor in the defeat of the English there. MONK: Long live King Hardrada! Those are your enemies, there. Quick! 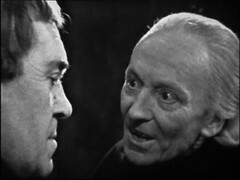 As I've said above the interaction between Hartnell and Butterworth is a joy to watch but Hartnell himself has been on fine form throughout this story. His glee at working out a way of stealing the Monk's dimensional control is fabulous. My dear fellow, I'm sure will you excuse me but I didn't want to say goodbye, as you are obviously going to be very busy for some time. Just in case you still have ideas about your master plan, I've taken precautions to stop your time meddling. How could he stop a Mark 4? Possibly one day in the future, when you've learnt your lesson, I shall return and release you. Release me? Ha! Me? Oh, the old fool. I wonder what he meant by release me? Well, I'll be going. MONK: Ah! Ah! What's he done? He's taken my dimensional control! He's ruined my time machine! I'm, I'm marooned. Marooned! In 1066. Oh, Doctor. Doctor! Doctor! 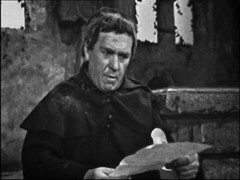 Peter Butterworth's Monk is a fantastic character and it's little surprise that he returns in the not to distant future in the next story that Dennis Spooner & Douglas Camfield take charge of. Well done to both of them for producing a fantastic story. I loved Spooner's first effort, The Reign of Terror, and enjoyed his Romans too far more than I thought I would. The same humour in those is present in this story through the Monk. The plotting is great: it sets up a mystery and plays it out. Little details like mentioning The Atomic Cannon on the plan before Steven & Vicki find it and making the Doctor go to such trouble removing the dimensional control circuit make the story which also accomplishes the educational aims of the series by imparting some lesser known details about a well known historical tale. 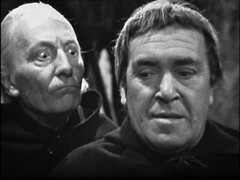 The Time Meddler is the first historical story with science fiction elements inserted into it, although The Chase featured a brief sequence with the Daleks on the Mary Celeste. As the historical story dies out we'll later come to see many more science fiction stories with a historical setting. 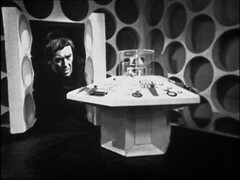 A section of the Dalek Masterplan takes place in Ancient Egypt pitting the Daleks against Pyramid builders for example and in later years The Time Warrior, Talons of Weng Chiang and The Visitation follow a similar pattern. 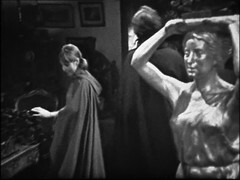 Indeed later in the series the production team realised that a good way to get decent costumes and sets out of the BBC was to set it in the past and treat it as a historical drama. It's no coincidence that many of the best Sylvester McCoy stories are set in Earth's past. Like episodes 1 & 3 of The Time Meddler episode 4 was recovered from Nigeria in 1984/5. The prints are believe to be those previously used in New Zealand because they contain cuts precisely matching what the New Zealand censor was known to have to have had removed. 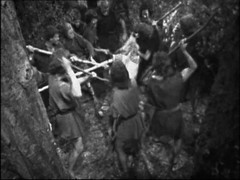 In episode 4's case the cut begins at 16:18 where 13 seconds of a Saxon stabbing two Vikings is missing. 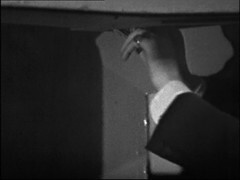 It's at the end of the scene, the picture fades to black and resumes with the Doctor fiddling with the Monk's Tardis console. No other copy of this episode has ever been found so to this day it remains incomplete. 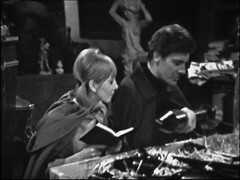 Interestingly Telesnaps are known to exist for this episode, but have never been published. I wonder if any of them show something of the cut section? Because of the change of cast, with Steven replacing Ian & Barbara, the Time Meddler has a very different feel to much of season 2 of Doctor Who. I'm led to wonder if any thought was given to holding it back to open the third season? 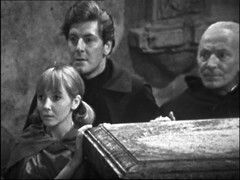 Although they don't get a huge amount of screen time here Vicki & Steven work well together, indeed they are probably my favourite set of Hartnell companions. It's just a shame that this line up is so short lived. But it is broadcast at the end of Season 2 and to mark the occasion the end titles are different starting with the faces of the companions and then the title captions play out over a starfield background instead of the usual black. The Time meddler was novelised for Target Books by Nigel Robinson and released in October 1987 in Hardback and March 1988 in Paperback. Having been something that seemed a bit of an ignored story for many years The Time Meddler came to prominence when it was chosen to open a repeat season on BBC2 in 1992. 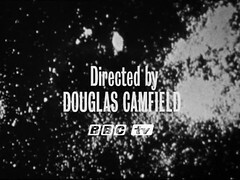 It aired on Friday nights from 3rd to 24th January that year was and followed by The Mind Robber, The Sea Devils, a newly recoloured The Daemons, (surprisingly) Genesis of the Daleks, Caves of Androzani, Revelation of the Daleks and Battlefield. See here for what was a complete list of terrestrial Doctor Who repeats. 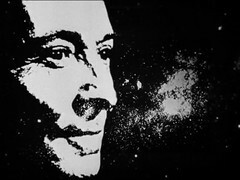 The Time Meddler was released on VHS in late 2002 in a boxset containing the last 3 complete William Hartnell stories not yet on Video - also included were the Sensorites and the Gunfighters. The Time Meddler posed numerous technical challenges which led to the then brand new Vidfire technique not being applied to it. 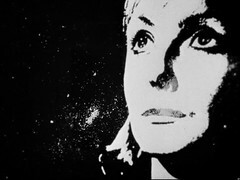 See The Restoration Team's article on the First Doctor boxset for more details. The Time Meddler was released on DVD on 4th February 2008 where the technical challenges again prevented Vidfire's use. 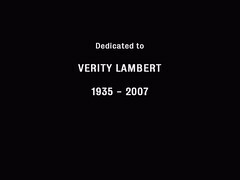 A slide appears at the end of episode 4 paying tribute to the show's producer Verity Lambert who had recently died. It's fitting that it should appear on this disc because, bar the miraculous recovery of Galaxy 4 or Mission to the Unknown this is likely to be the latest story of her reign released on DVD. Sadly it will be another TEN episodes before I next get to watch a complete episode as we're now entering the period of the program really devastated by the junkings of the 1970s. So I'm afraid that in the next few weeks they'll be lots of listening to CDs instead of watching on DVD or Video. 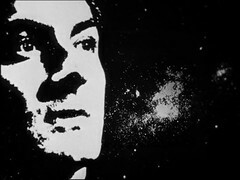 So tomorrow we start Doctor Who Season 3 with Galaxy 4 Part 1: Four Hundred Dawns. Thankfully since then the situation has changed and it's only TWO episodes on CD before the next we can watch a whole episode.... and there's a sizeable chunk of the first of those two in existence! Join us on Friday 11th September for Doctor who episode 82 Galaxy 4 Episode 1: Four Hundred Dawns and if you can't wait that long then our 40 years of Tom Baker blog is back on Sunday 30th August with Doctor Who episode 402 Terror of the Zygons: Part One!